Matthew Thomson refers to himself as “sort of a picker.” The artist gathers objects he finds on the street and converts them into intriguing works of art. The well-established Concordia alumnus spent a number of years earning his bachelor’s and master’s degrees in the fine arts program. Now, working toward an art education degree, Thomson teaches art at multiple high schools and the Visual Arts Centre in Westmount. While speaking about New Jazz, his current installation at the Ymuno Exhibitions gallery, Thomson described his university career as “never ending.” The same, it seems, could be said about the constant artistic inspiration he draws from his immediate environment. While walking the streets of Montreal, Thomson is inspired to tell the stories of the objects he finds. Upon viewing his work, the audience is immediately drawn in, wanting to get a closer look at the intricacies of his craft. Thomson’s pieces, which often begin with an old door or picture frame, are then layered with delicate wirework and carefully hand-placed sequins. New Jazz takes its name from one of Thomson’s pieces of the same title, which consists of various objects Thomson collected, including piano keys, a toy car and two sets of plastic teeth, sitting inside a picture frame. In a corner of the gallery Thomson called “the party section” sit his pieces Party Guests, Party Animals, The Fall and Birthday Boy. The first is a collage of the various personalities that would be found at a party. Some of the painted faces wear masks and others display joyful, stern or animated expressions. Party Animals, another collage piece, displays two young girls in conversation with each other. Thomson cut out the faces of the girls to create an odd but intriguing image of youth. A third collage, The Fall, concludes the party journey from playfulness to despair. A small cutout of a person is suspended against a dark and textured backdrop. 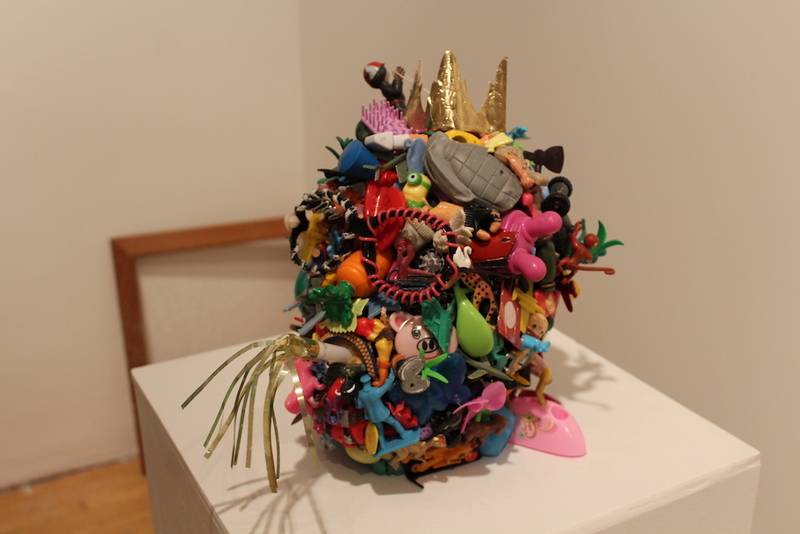 The fourth and final piece of the section, Birthday Boy, is made entirely out of children’s toys Thomson found on the streets of Montreal. As a sort of contemporary ode to Arcimboldo’s 16th century fruit portraits, Thomson explained, he arranged the toys to form a head. The festive bust wears a golden crown, has a plastic carrot for a nose and holds a party horn in its mouth. From the objects Thomson finds to the pieces he creates himself and continues to alter, the idea of deconstruction and reconstruction is a thread that runs throughout the exhibition. One example of this process can be seen in his piece titled Admit One. The mixed media framed piece depicts a piece of roadkill laying on top of a silver drain grate. The drain has been covered in shimmering silver leaf which catches the viewer’s eye. Upon further inspection, spots of reddish brown in the silver become visible. Thomson explained that he purposefully didn’t cover all the silver in varnish, allowing parts of it to oxidize and rust. He attributes this unconventional technique to his inner “mad scientist.” Playing with certain techniques and processes cultivates “a stronger connection between you and the things you’re working with,” Thomson said. In New Jazz, Thomson also addresses the concept of inanimate objects having a history of their own. His piece, Untitled (which he also referred to as Survivor), is a chair he found and chiselled pieces off of to make it appear battered and worn out. The result is an object that looks as though it has been beaten and chewed but remains strong and autonomous. Thomson said he wanted to “create a character out of the chair itself.” By seeing the chair as its own character, the viewer is able to imagine its previous life, as well as its resilience and strength. Ymuno Exhibitions is run by Concordia alumni Madeline Richards and Ben Williamson. The duo met Thomson while they were completing their undergraduate degrees, and they recently reconnected to showcase Thomson’s work. New Jazz will be displayed at Ymuno Exhibitions until Sept. 30. Admission is free.